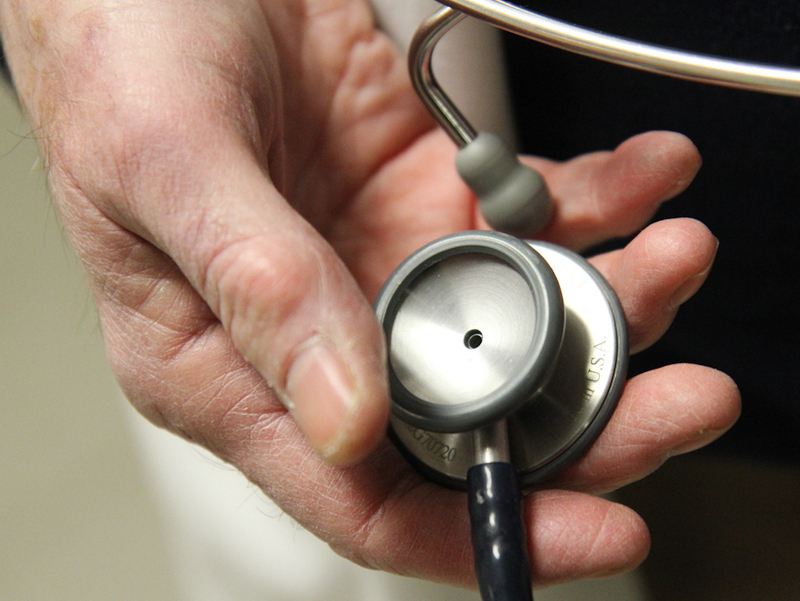 The Stethoscope: Timeless Tool Or Outdated Relic? : Shots - Health News Why is a 200-year-old icon of the medical field still in wide use in the digital age? Some say modern tools are more informative and worth the extra cost, but the stethoscope has staunch defenders. 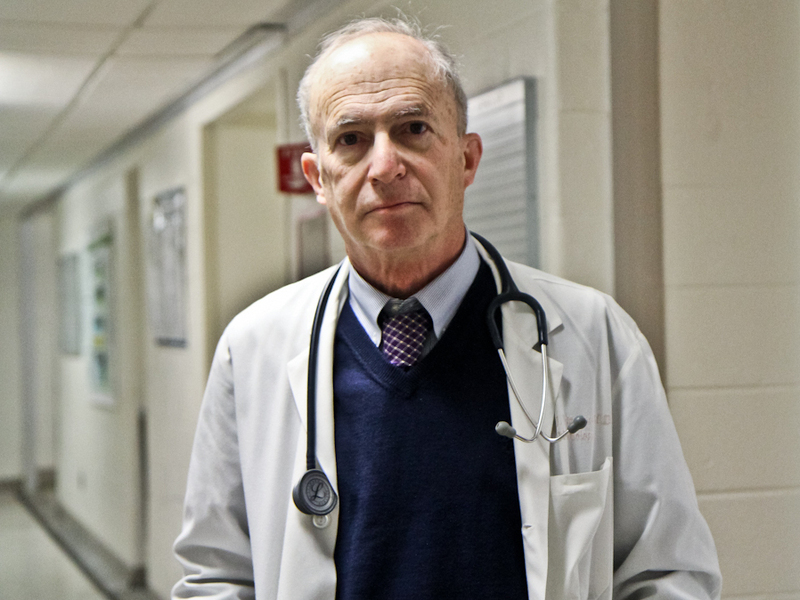 Kidney specialist Steven Peitzman, a professor at Drexel University College of Medicine, says physicians who are now in their 60s and 70s used to get praise if they had the "ear" to hear and interpret subtle sounds through a stethoscope. To hear a patient's heart, doctors used to just put an ear up to a patient's chest and listen. Then, in 1816, things changed. Lore has it that 35-year-old Paris physician Rene Laennec was caring for a young woman who was apparently plump, with a bad heart and large breasts. Dr. George Davis, an obstetrician at East Tennessee State University who collects vintage stethoscopes, says the young Dr. Laennec didn't feel comfortable pressing his ear to the woman's bosom. He says doctors used to get praise if they had the 'ear' to hear and interpret the subtle body sounds that travel through a stethoscope's rubber tubing; the stethoscope is the iconic symbol of a physician. Vidya Viswanathan, a first-year student at the University of Pennsylvania's Perelman School of Medicine, is still getting used to hers. Some doctors say clinicians can now get much more information from newer technology than they can get from a stethoscope. Clinging to the old tool isn't necessary, they say. "You don't realize until you are wearing it and trying to use it, how pokey it is in your ears," she says. "I'm almost embarrassed to wear it because it implies I have knowledge I don't have yet." "I am astounded at the things I'll find with my stethoscope," says Allison Rhodes, a third-year student at the Perelman School of Medicine. "I had a patient that had pneumonia, and it was really wonderful to be able to listen to her and say, 'This is what I think it is.' And then, later, see on the chest X-ray that that was exactly what it was." But some argue that the stethoscope is becoming less useful in this digital age. Dr. Bret Nelson, an emergency medicine physician at Mount Sinai Hospital in New York, says clinicians now get a lot more information from newer technology. He admits the stethoscope is an icon but doesn't buy the argument that if you lose the stethoscope, you lose the tradition of "healing touch." "Pulling an ultrasound machine out of my pocket, or wheeling the cart over next to the patient [and] talking through with them exactly what I'm looking for and how I'm looking for it — the fact that they can see the same image on the screen that I'm seeing strengthens that bond more than anything in the last 50 years," Nelson says. Nelson is 42 years old and graduated from medical school 16 years ago. He teaches medical students, and says it's helpful to show new learners what "lies beneath." At Mount Sinai, when medical students are taught to examine a heart, they learn how to use the stethoscope and an ultrasound machine on the same day. "Shouldn't we be using what is low-tech and practical?" he asks. Nelson counters that point-of-care imaging is becoming less expensive every day. Twenty years ago, he says, an ultrasound machine was as big as a refrigerator and cost $400,000. Today, a handheld, portable device plugs into a computer tablet and costs less than $10,000. Many care providers in the community may even have an ultrasound in their pocket one day soon, he says. Who would have foreseen that today we have, "a slide rule, a calculator, a flashlight, a phone, a computer terminal and 36 video games," all on one device — our smartphone. This story is part of NPR's reporting partnership with WHYY's health show The Pulse and Kaiser Health News.